I made the cake with marble cake mix and homemade butter cream frosting. The idea actually came from my fiancee;. 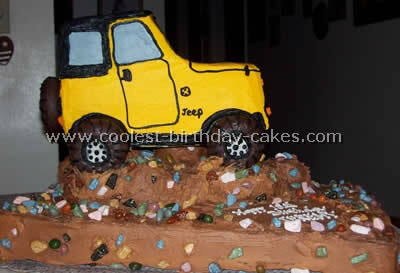 He wanted a jeep cake for his birthday so thanks to this site for homemade birthday cakes we got ideas of this cake. I made it with a jeep mold he found on eBay. It was simple to do. This is only my second time frosting a decorative cake. I really enjoyed it. I always make homemade birthday cakes for our birthdays so for this birthday I made four 10 X 14 cake slabs (two chocolate, two white). I iced the cakes normally. I measured the cake then cut an area out for the inside of the cake. Once this was done I used some fondant and made some rope and other accessory to be placed on the cake before I covered it in fondant. Once it was covered in fondant I made the wheels out of rice crispies and covered them in modeling chocolate. then I placed the dragees around them for decorations. Once this was dry I placed the wheels in their positions. I made the people for the cake out of fondant and their facial features and hair out of icing. I covered the back half of the cake with X pattern made with icing. The side bumpers are made out of modeling chocolate covered in fondant. This cake was made for a cousin’s 18th birthday. 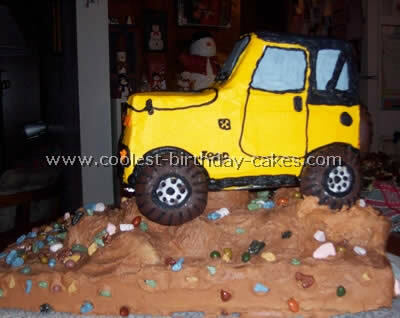 He happens to have a yellow jeep and seeing as we only make homemade birthday cakes for family birthdays we decided to make a jeep just like his! 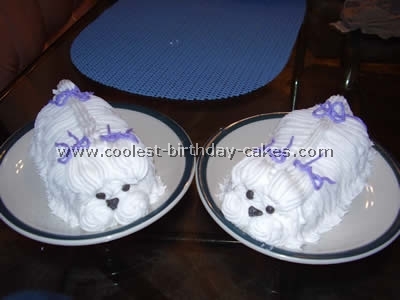 I started with a sheet cake and made several cupcakes and cut them in half. I frosted the cake and added the cupcakes in mounds to form the hills. I placed the jeep cake on a board the same size as the jeep and used four pillars hidden in the mounds to hold the jeep cake so it looked like it was driving over the hills. 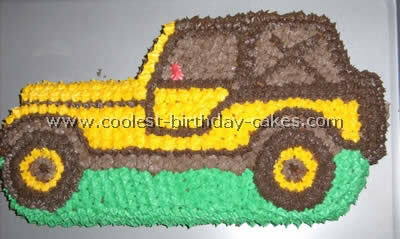 The jeep cake was baked and cut to make the shape of the jeep. It had to be the same yellow as his real jeep. I even sneaked over to his house and wrote down his license plate number so I could have his on the cake. I found candy rocks like M&M’s to scatter all over the dirt looking frosting. 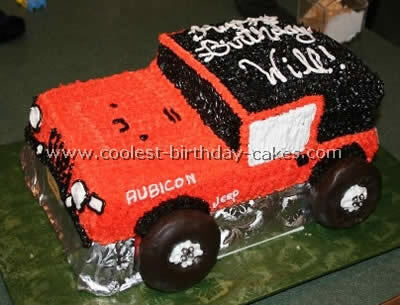 It was a surprise party but he was really surprised by the jeep cake! This cake was fun to make. 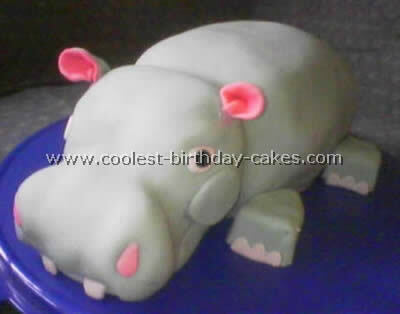 I searched many birthday cakes and this one most impressed me. 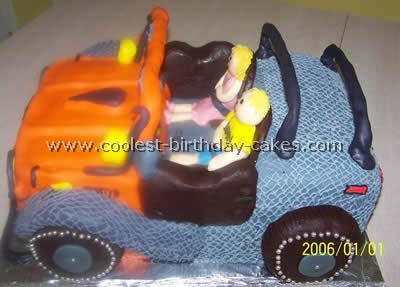 I used a sheet cake for the bottom and cut 1/4 off to make the top of the vehicle. I used a picture of a Rubicon Jeep for all the detail. The wheels are chocolate doughnuts with icing filled in the center with silver edible balls for the hubcaps. To raise the vehicle off the board so I could get the wheels on I covered a sheet pan with silver foil.